We have this and many other versions of Merlin the Wizard Costume. We also have Wizard Warrior Costume Attire, Weapons, Robes, Cloaks, Chain Mail Coifs, Leather Gauntlets, Mystical & Dragon Amulets, Wizard Rings, Finger Rings, Leather Garments, Leather Belts Vests and a lot more. Get the entire costume or just the pieces you need. Need Tall Walking Sticks, Wizard’s Staffs, Prophet’s Rods, Shepherd’s Crooks, Primitive Weapons or other types of Tall Canes & Staffs or other unusual of strange pieces to costumes for Bible, Story Book, Fantasy, Medieval, Legendary or hard to costume characters? Welcome to Dallas Vintage Shop, we are here to provide what you usually cannot find at other costume shops. From Theatrical to Theme Parties, we have complete costumes or just the pieces you need. 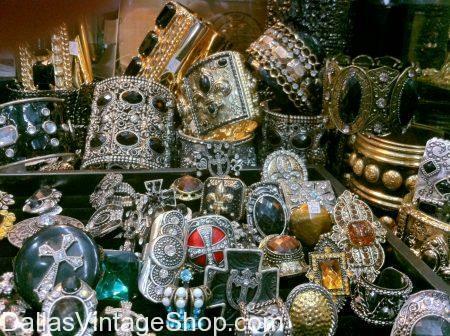 We have all the mens Renaissance and Medieval Costumes and Accessories including Jewelry fit for a King or any class. As a matter of fact we have costume Jewelry for any decade, century and even fantasy. Renaissance Belts, Baldrics, Sword Belts and Frogs for any kind of Renaissance, Medieval Historical or Fantasy Outfits. We also have Belts & Sword Belts for Roman Soldiers, Vikings, Game of Thrones, Lord of the Rings, Gladiators, Spartacus, Knights, or any other costumes you can imagine. We have the Armor and Weapons too. Wizard’s Staff, Wizard’s Wands, Wizard’s Walking Sticks, Wizard’s Weapons, Wizards Hats, Cloaks, Weapons, Robes, Leather Garments, Arm Bands, Amulets, Tunics, Leather Clothing, Capes, Fur & Faux Fur Garments, Leather Bags, Belts & Frogs, Gauntlets, Mystical Jewelry, Wizard Wigs or Beards and so much more. Complete outfits for Merlin, Gandalf, Medieval, Mystical, Fantasy, TV Shows, History Channel Viking Wizard, Movies and any Wizard you can possibly think of. You are in Merlin category.